Nostalgic Pleasure Flights above Budapest! With Oldtimer Li-2, Po-2 and Kánya aircrafts! 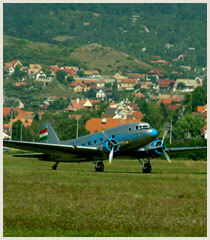 Goldtimer Foundation arranges pleasure flights from 22th April till 31st October from Budaors Airfield (LHBS) with the only Li-2 aircraft worldwide which still operates (Soviet made DC-3) and a Po-2 aircraft which brings back the atmosphere of the ancient times of aviation. PPR we at the disposal of our passangers over the weekends or even on weekdays. Our Li-2 aircraft accomodates 19 passangers, the minimum number of passangers is 17.
with Li-2, Po-2, Rubik Kánya and Cimbora aircrafts. for 75th anniversary of D-day and air bridge of Berlin blockade. 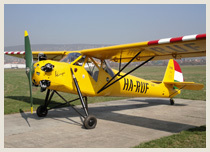 Dunaújváros Airport (LHDV) for airshow. Other routings are also available on request. Discover the pleasure of sitting in an open cockpit biplane! Leather hat, scarf, just like in the good old days! Surprise your friends or relatives with a real flying experience!